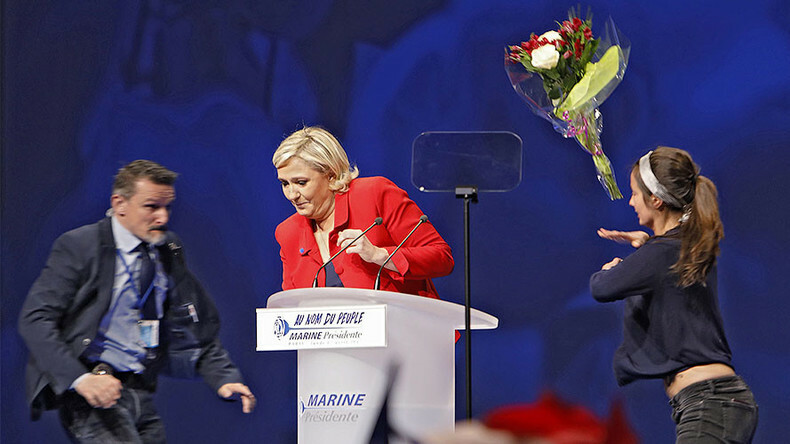 With the French presidential election just days away, National Front leader Marine Le Pen was interrupted on stage by a flower-wielding FEMEN protester. Footage of Monday's incident shows a young female protester running towards the presidential hopeful with a bunch of flowers held above her head, seemingly waving them in the direction of the presidential candidate during a rally at Paris’ Zenith arena. It seems as if the protester is about to remove her top before she is rushed by Le Pen’s security detail, who drag her along the ground by the arms and out of sight of the cameras. A short time later, a second protester was also removed from the event after she started shouting during Le Pen’s speech. “She should have stayed a bit, she would have learned something," Le Pen said, according to BFM. Earlier on Monday, protests erupted in the capital ahead of the rally. Smoke grenades were reportedly thrown at riot police, with tear gas being fired in return. RT correspondent, Charlotte Dubenskij, was caught in the middle of the scuffles while covering the standoff. “We have been caught in tear gas, we have had bricks thrown at us, one member of the press had his camera taken off of him and thrown on the floor,” she said, adding that fires also erupted.